What if I told you we may not be too far off from The Six Million Dollar Man? The truth is we aren't, and you can profit from this cyborg revolution. Robotics is an exploding industry. 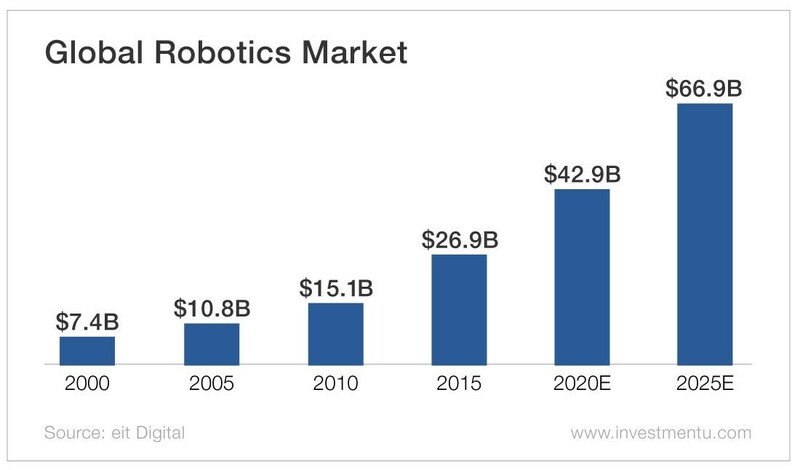 It's expected more than $66 billion will be spent in the robotics sector by 2025. The medical industry in particular will change completely thanks to robotics. The most advanced robotic limb known to the public is Defense Advanced Research Projects Agency's (DARPA) Modular Prosthetic Limb (MPL). It's currently being tested on a Floridian man, and the arm is completely controlled by his thoughts. That's where tech startup Open Bionics comes in. It's attempting to bring robotic limbs to the masses. Its 3D-printed hands aren't nearly as advanced as DARPA's tech, but they're affordable and work. Already these limbs have changed lives. In addition to robotic prosthetics returning lost limbs to amputees, there are also robotic exoskeletons, like the ones made by Ekso Bionics (Nasdaq: EKSO). These technological marvels are being used to help stroke patients walk again. Ekso's exoskeleton technology can also be used preventatively, making hard labor jobs safer by increasing the strength and endurance of its wearer. Surgical robots, like Intuitive Surgical's (Nasdaq: ISRG) da Vinci Surgical System, are already in use and generating results. Da Vinci can perform tiny, exact movements better than human hands. It helps surgeons perform minimally invasive, laser-precise procedures, and it cuts down the time needed to train new surgeons. The surgical robot sector is exploding. Da Vinci is great for general surgery, but more specialized machines are just around the corner. Robotics is the future of medicine. Already we have machines saving lives and helping amputees regain their freedom. The future is already here, and there's a fortune to be made investing in the companies making the world a better place through robotics.